No Pantechnicon supplement this issue, but we have our fingers crossed that it will return, one last time, for #34. I can confirm that it most definitely will. I'm currently working my socks off to ensure it happens. We have a book launch tomorrow, so I hope no one has made plans! Oxfam Books and Music Moseley are having an Arthur Conan Doyle night as part of Oxfam's Bookfest, and they're using our new collection of Conan Doyle horror, The Conan Doyle Weirdbook, edited by Rafe McGregor, as a hook. There will be dramatised readings of the stories and other shenanigans. The book will be exclusively available from Oxfam Books and Music Moseley for a period before being made available more widely. The event is at the Prince of Wales pub, Alcester Road, Moseley Village, Birmingham, on Saturday 17th July starting at 7.30pm. The entry fee is a book donation! Freed from the yoke of BFS servitude, I've finally finished TQF34! It features a series of terrific stories, an indulgent editorial, our first ever convention report, and a huge review section: twenty-two books, seven movies, three audio reviews, one comic and one game. The cover is once again by the wonderful Howard Watts. The free pdf of this issue can be downloaded here (it's the perfect size for reading on an iPad). Ebook versions are available for free from Feedbooks. The paperback is available for £3.99 from Lulu. Further details here. Feeling hopeless about 2011? 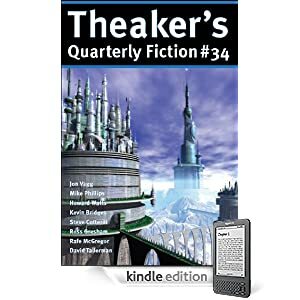 Here’s Theaker’s Quarterly Fiction #35, 96 pages of fiction and reviews, to wash away your pain with the pain of others. “Involuntary Muscle” by Black Static contributor Maura McHugh tells of Lilly, her unhappy life made more miserable yet by surprising news. “House of Nowhere”, a novella by Matthew Amundsen, concerns brave Hully Bo, trapped in a submerged house and tortured by the mean and mysterious Conjurer. We then have reviews of books by Justin Isis, Brendan Connell, Lucius Shepard, Johnny Mains, André Gide, Kevin Anderson and Sam Stall, Scott Edelman and Kristine Ong Muslim, and of the latest instalments of Doctor Who and Harry Potter. In the comics section we take a look at Clint #4, the wonderfully wordy Showcase Presents DC Comics Presents Superman Team-Ups, Vol. 1, and Strangers: Homicron. The seasonal cover is by lovely Howard Watts. The issue’s available in all our usual formats, most of them completely free. Links and further info here. 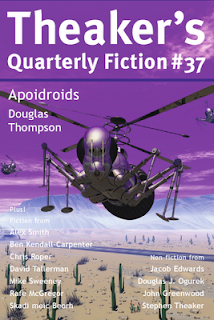 Our next issue will be #36, out on March 27. 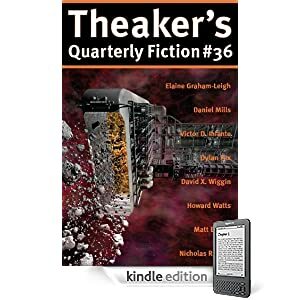 Theaker’s Quarterly Fiction #36 is out! 144 pages of fiction and reviews, all available for free download, but also in print as a lovely paperback book should you prefer. Links and further info here. Our fiction this time: "The Photographer’s Tale" by Daniel Mills, "A Fable of Worcester" by Victor D. Infante, "Angeline of the Woods" by Dylan Fox, "Told in a Brothel on Darien" by Elaine Graham-Leigh, "The Burden of Proof" by David X. Wiggin, "Totem" by Howard Watts, "Huracan" by Matt Baxter and "'A' Story: an Animated Adventure" by Nicholas Rasche. I think it's one of our strongest ever line-ups. The Quarterly Review takes in four Doctor Who audio adventures, books from James Lovegrove, Michael Moorcock, Brendan Connell, Stephen King, Michael Croteau and Gary McMahon, and comics from the brothers Nicolle, Black Coat Press and Dargaud. In our film section, Jacob Edwards and Douglas Ogurek review The Adjustment Bureau, I Am Number Four, Paul, Season of the Witch and Tron: Legacy. The space-age cover is by superstar artist Howard Watts, and Ben Ludlam illustrates the story "Huracan" in the pdf and print editions. If it weren't for the slightly lazy editorial, I'd call this our best ever issue! We're currently reading for issue 37, by the way, due out June 27 - submission guidelines are here. We've finally got around to putting a couple of our books up in the Kindle store. Michael Wyndham Thomas's The Mercury Annual was described in Tony Williams' Prism review as "one of the strangest stories I have read in a long while", and is available for 86p. And if your idea of heaven is a book that was written in a week and ends with a slap-up dinner then we've got just the thing for you: Professor Challenger in Space by me, now available in the Kindle store for the grand sum of 86p. 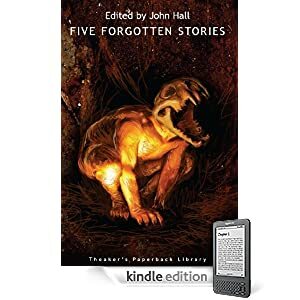 Another of our books is now available via the Kindle store: Five Forgotten Stories, by the mysterious John Hall, a member of the International Pipe Smokers’ Hall of Fame. The cover - one of my very favourites - is by John Shanks. The book is currently available for 86p. We put the print version of this one out back when I was a bit overwhelmed with BFS stuff, so I don't know if anyone actually heard of it! If any bloggers etc would fancy a review copy of this (or of any of our titles), in print or as an ebook, do get in touch. We've added three more titles to the Kindle store, though I had to reassure Amazon first that I was indeed the publisher of them. I refrained from suggesting that the clue was in the title of the magazine. Anyway, here they are, all ready for your little grey lovelies. Each costs just 86p. The editorial, How Could a Person Up and Call a Person Wack? !, addresses the suggestion put to us in recent months that giving books bad reviews is something one should avoid; it also briefly discusses what steps I'm taking to improve the visibility of female writers in future issues, given their embarrassingly total absence from this one. The review section stretches to thirty pages, covering books by McSweeney’s, Jason Heller, Matthew Hughes, Ian Whates, Richard Parks, Adam Baker, Daniel Mills, Gary Fry, Andy Remic and D.F. Lewis, as well as CDs, comics and films. Howard Watts is our beloved cover artist. 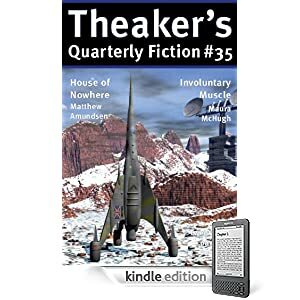 Further information and links to all the various formats (most of them completely free) can be found on our blog: Theaker's Quarterly Fiction #37. I think Stephen's article completely misnderstands my blog 'No Blame'. But I'll allow mysef to be blamed for allowing those loopholes to be exploited. I'll let others decide, too. I was not talking about ordinary bad reviews, but deliberately *very very* bad reviews indeed, ones that people have written to me privately agreeing with what I was saying in this context about the John Greenwood review. And I was careful not to assign blame or come to any conclusion, hence the title. Nor have I doubted the existence of anyone. I even joined John Greenwoods's Facebook page as a Friend. Thanks for taking the time to read my editorial, Des. Obviously, I don't agree with the distinction you are making between "ordinary bad reviews" and "deliberately *very very* bad reviews", since the implication is that John's review was written with malicious intent, rather than just because he didn't think your book was very good. If a reviewer thinks that a book is very, very bad, s/he should give it a very, very bad review. There's nothing to be gained from pretending books are better than they are. Thanks, Stephen. I hope people will see what I mean if they investigate further. It's precisely because of that context - because we had publicly argued, here on the BFS forums - that I passed the book to John for review. If you don't think John should have reviewed your book in that context, I'm sure you agree with my conclusion in the editorial that we should not review your books in future. I certainly agree with your last point, because of the wrestling image in the JG review - was it wrestling or boxing, I can't recall.